By next day, his fever was gone and you could not tell the kid was even sick. I was surfing YouTube when I came across a testimonial for your product. I ordered some because I know the drawbacks of antibiotics. Not long after receiving it, my 7 year old grandson tested positive for the flu. He was running a high fever and had a lot of congestion. I gave him 15 mL every 6 hrs. By the next day the fever was gone and you could not tell the kid was even sick. It literally worked within 24 hours on the flu. Also I would like to say if were not for this company I would not be able to afford this product. Comments for By next day, his fever was gone and you could not tell the kid was even sick. 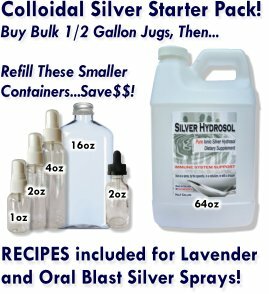 Thank you so much for that colloidal silver testimonial! I'm thrilled that such a small amount of our supplement was able to have such a profound effect! Lately, I've been studying how water has "memory" and is affected by its surroundings. It's leading me to formulate a theory that, since the body is 70-80% water, that colloidal silver's abilities aren't just because of the antibiotic properties of silver, but that the water is healed and becomes healing for the water in the body. This might seem bizarre, but science has easily proven water's memory and, again, the rest is just my theory. It's a fascinating possibility! And it makes sense. Stagnant water is no fun to look at or be around. Water in the form of streams and waterfalls are so refreshing to be around. And in people, the ones that lay around all day as couch potatoes are kind of like the stagnant water (remember our bodies are mostly water!) and people that are in motion bring us the most energy. But back to your story, thanks again for sharing it and please come back and share more?